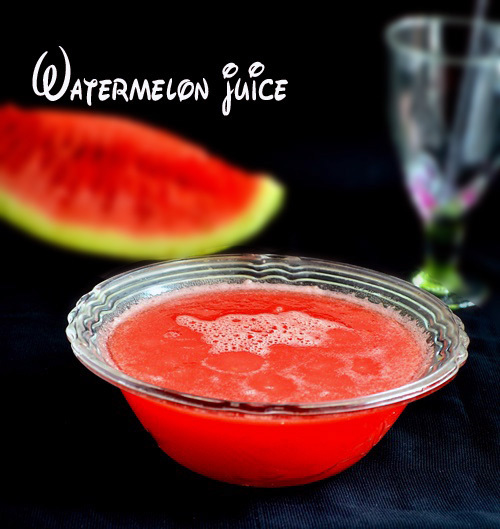 Watermelon juice is an effective thirst quencher and coolant to beat the summer heat with amazing health benefits.Though i know this very well,I have never bought this fruit as i had an aversion from my childhood.But now,being a food blogger,i love to try and taste recipes with all vegetables or fruits.So this year i bought watermelon for the first time and prepared this juice.Its basically a low calorie drink but its filling and keeps us energetic & active for hours.Its always good to eat a fruit as it is instead of making juice adding sugar and other sweeteners.We too like that way.But for blogging purpose,i made this simple juice recipe .Soon i’ll post an easy salad for summer with watermelon. 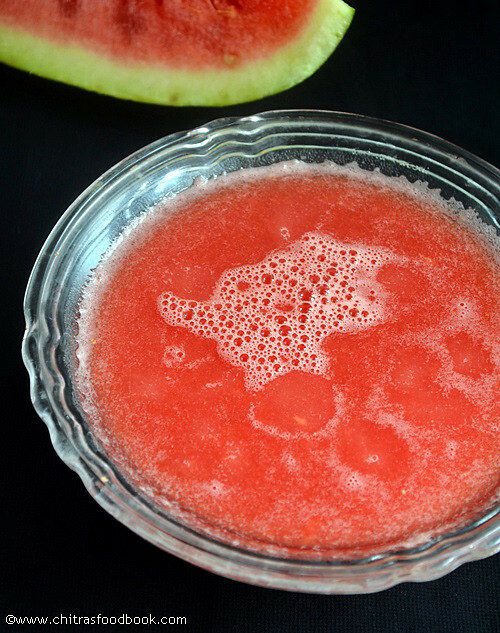 Watermelon juice recipe to beat the summer heat ! 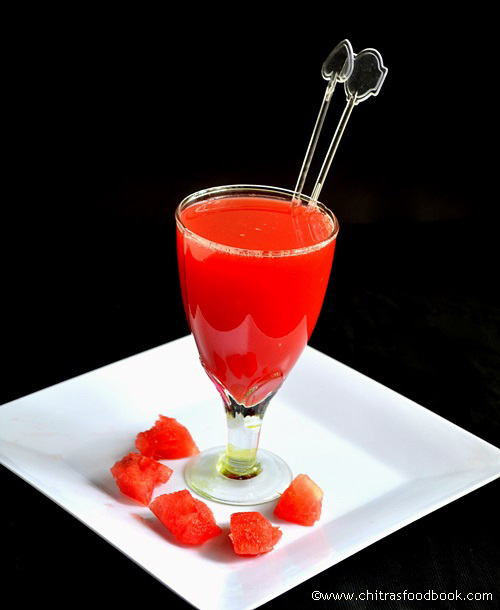 Cut the watermelon into slices and remove the seeds.Cut into small cubes and grind it along with sugar or honey if desired.I din’t use sugar as my watermelon itself was very sweet.Add a pinch of chat masala or pepper powder if u wish.Strain the juice and enjoy adding ice cubes!! 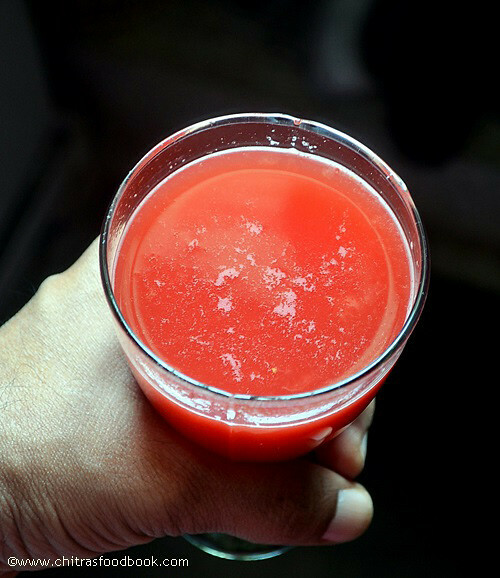 Its always better to have this fruit as it is.Some kids don’t like to eat.So u can make this juice and try..
Consume the juice immediately after u grind. Addition of chat masala or pepper powder is completely optional. I have seen some recipes adding mint leaves,lemon juice and ginger along with watermelon.Do try for variation if u like that flavor. Serve chilled and fresh ! Enjoy !! wonderful pics.. agreed its tastier to eat as a fruit.. because we strain all the fiber... waiting for those salads! I can drink this juice anytime of the day,my all time favourite. perfect for this summer .cant take my eyes off the pic. Juice looks super refreshing and lovely.